Can Caribbean stars hold on to their crowns? In Jamaica, the popular mantra goes "we likkle but we tallawah" which, basically translated from patois to English, means "we are small but we are talented". That was borne out on the greatest stage of all this time last year when the Caribbean island of about three million souls wowed the word. The country swept the men's and women's sprint events at the Beijing Games on its merry way to a record haul of 11 medals including half a dozen of the most important hue, gold. The athletes' heroics sent the island into a nationalistic frenzy not seen since Jamaica's Reggae Boyz soccer team qualified for the 1998 World Cup and then Prime Minister PJ Patterson declared a public holiday. Led by larger-than-life Usain Bolt, who stole the show in the second week of the Olympics with three world records in three golden performances, the men and women in green, gold and black finally usurped their great northern neighbors, the United States, as the pre-eminent power in sprinting. Training camp controversy aside, most of those athletes should be back in action from tomorrow when the 12th IAAF World Championships kick off in Berlin. However, with Olympian success comes a burden and the island is now not hoping for golden performances, it expects them. Triple world record holder and three-time Olympic gold medalist Bolt will be at the forefront of the Jamaican charge and the 22-year-old, who will celebrate his 23rd birthday during the Champs, will also be the most watched athlete on show in the German capital. The 100 and 200m sprints appear his to lose; although American Tyson Gay, the defending world champion in both events, has clocked world-leading times this season (9.77 and 19.58) to set up the marquee match-ups of the meet. Berlin will mark their first head-to-head clashes since the 100 in Beijing. For Bolt, the real threat lies over his pet distance, 200m. "I think Tyson Gay has a better chance over 200m, Because I'm taller it's better for me (in the 100m). So when I hit the top speed I really go faster, so I think it's going to be really hard for him to get down to the same time because he's not as tall and his start's not as good. He's got to really improve his start to get down to that time." Gay, hampered by a hamstring injury last year which saw him miss the Games' 200m and under-perform in the 100, says he's up for the showdown. "I've always felt in my mind that I could challenge him," Gay said. "It's not like he's always been the world record-holder or he's always been the Olympic gold medalist. He's always been Usain Bolt to me. I've beaten him before, he's beaten me before." Defending World Championships 100m champion Veronica Campbell-Brown, also a dual Olympic 200m gold medalist, will lead a strong Jamaica women's team which includes Games 100m champion, the pocket rocket Shelly-Ann Fraser, and Kerron Stewart, who collected silver behind Fraser in Beijing and has been in near unbeatable form this season in the 100m. Jamaica's other Beijing individual champion, Melaine Walker, will be keen to add a world title to her Olympic 400m hurdles gold and cap a brilliant 12 months but she has not been anywhere near her best this year. The women's 400m could provide the most compelling competition outside of the Bolt-Gay clash with Britain's Olympic champion Christine Ohuruogu facing Jamaica's Games silver medalist, Shericka Williams, and Jamaica-born US star Sanya Richards. However, the standout star should still be Bolt, who raised sprinting to another level in Beijing with record runs in the 100 (9.69 seconds) and 200 (19.30) as well as helping the relay team to gold and another record in the 4x100 final. Almost three quarters of a century ago another young, black athlete stunned the world at the same Olympic Stadium by capturing four gold medals (100, 200, 4x100 and long jump) at the 1936 Berlin Games. This feat was performed under the baleful gaze of Adolf Hitler, who saw his Aryan supremacy myth slapped fully in the face. Bolt, like the great American Jesse Owens, has already etched his place in track-and-field lore and will simply be building on his legacy if he can replicate his Beijing form. The people of Jamaica don't hope he can, they now demand it so they can boast to the world just how "tallawah" they still are. 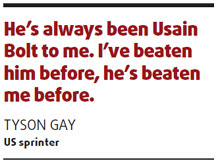 Tym Glaser was Associate Editor - Sport at the Jamaica Gleaner for 14 years.